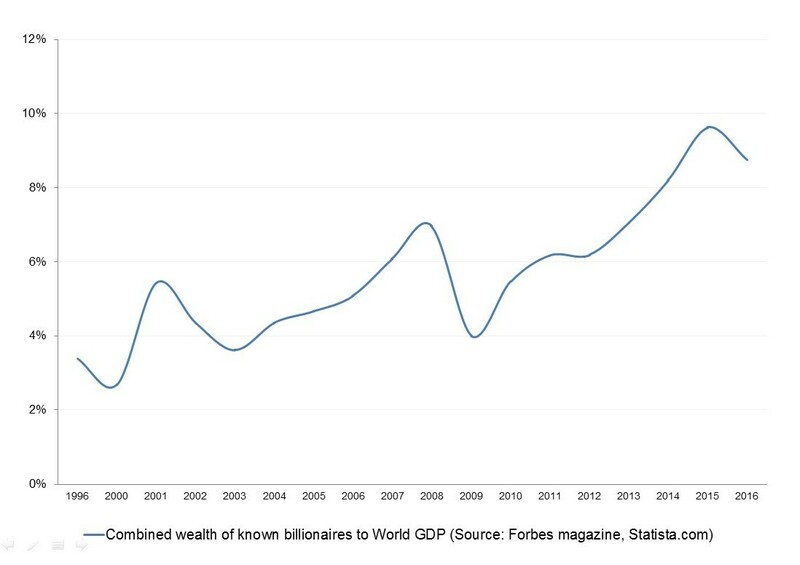 Today, private capital in the hands of billionaires represents 9% of global GDP compared to 3% 20 years ago, thus making billionaires significant players in the world economy. Today, more and more extremely wealthy people are accepting that because of their position of privilege, they have a duty to give back to society. Just 20 years ago, only two of the 10 richest people in the world – Warren Buffet and Bill Gates – had committed to using most of their wealth for social causes. Now, many more have taken the same step. Take the example of the Giving Pledge, where extremely rich individuals commit to give the majority of their wealth to philanthropic causes. When it was founded in 2010, 40 people joined, with combined assets worth more than $125 billion. Today, you’ll see 142 names on that list, worth a combination of $732 billion. That’s nearly 1% of global GDP and 10% of the wealth owned by billionaires. Global rates of inequality are not something to ignore. Not only is it unfair, but research suggests its bad for growth. As the Forum wrote back in 2014, figuring out how to tackle rising inequality is one of the key challenges of our time.